Brian Champie did it again! 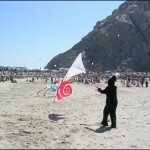 With some help from the Chamber of Commerce, he pulled together a non- stop show of Kite Performers. 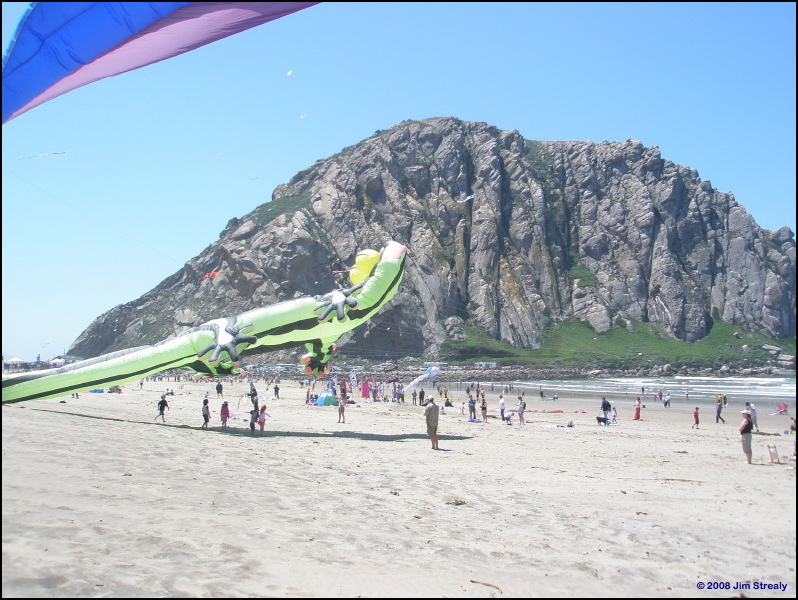 My kite adventure started when Brian picked me up at the airport on Thursday, so we could fly at a few school assemblies on Fri.
Steve Dinielli was my chauffeur on Friday. He helps people find loans to live in this beautiful area, he never had to point out how beautiful the county was. It spoke volumes for itself. It is a gem of a town. I would have guessed that Los Osos means Lost Oasis, but I’d be wrong. Los Osos was named in 1769 by Gaspar de Portola’s expedition due to the large number of Grizzly Bears they encountered. “Lost Bears” Valley of the Bears. Etc. 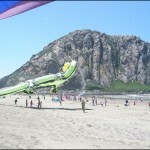 Driving through the Morro Bay- Los Osos area was such a delight, a stunning California oasis. The yards were covered in little pink flowers. Seems like everywhere I went I was driving through part of a beautiful golf course. Morro Bay recently added a boardwalk from the Embarcadero to Morro Rock adjacent to the beach scheduled for the Kite Festival. Even the locals are getting on their feet and enjoying the pedestrian walkway as much as the tourists. It is another added attraction to a spectacular destination. The Chamber of Commerce, PTAs and educators planned the school assemblies. We kitefliers enhanced their prepared science lessons on flight using our kites. It was an easy order to fill. All the kids, at all four schools had made their own kites and many were able to fly them on campus after the scientific demonstrations. Sixteen-year-old Alex Herzog was totally pumped when Morro Bay’s Mayor Janice Peters personally picked him up. Mayor Peters chauffeured Alex to the school where he flew an indoor demonstration before the kids flew their outdoor demonstration. We heard it was amazing. The school gave him a standing ovation. Way to go Alex! I gave two demonstrations – one at Baywood Elementary and one at Monarch Grove Elementary. 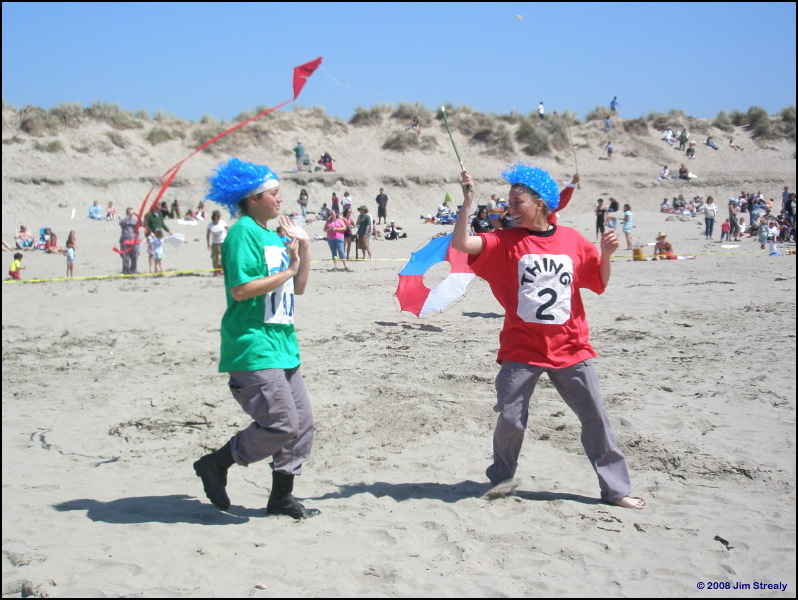 At Baywood the science teacher gave a kite lesson on what it takes to fly a kite with his ventriloquist dummy. It was adorable. He kept those kids in stitches. The lesson itself was also very good. 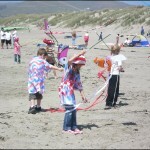 What does it take to fly a kite? After his lesson, it was my turn. I called Indoor kiteflying “Fuzzy logic” (a newspaper quote). 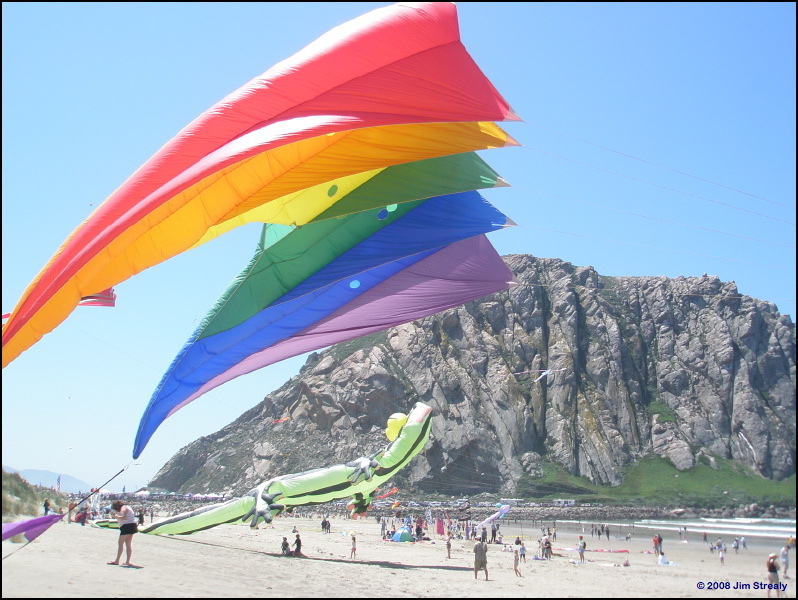 With light kites, you do not need “wind”, but you still need lift. I directed the kids in the gym to push the palms of their hands across their front and *concentrate…* They could feel that little bit of air that creates lift.. So AhHa~ Movement creates lift. That’s how we fly our kites indoors. Is it still fuzzy logic? Well, the kids enjoyed it. 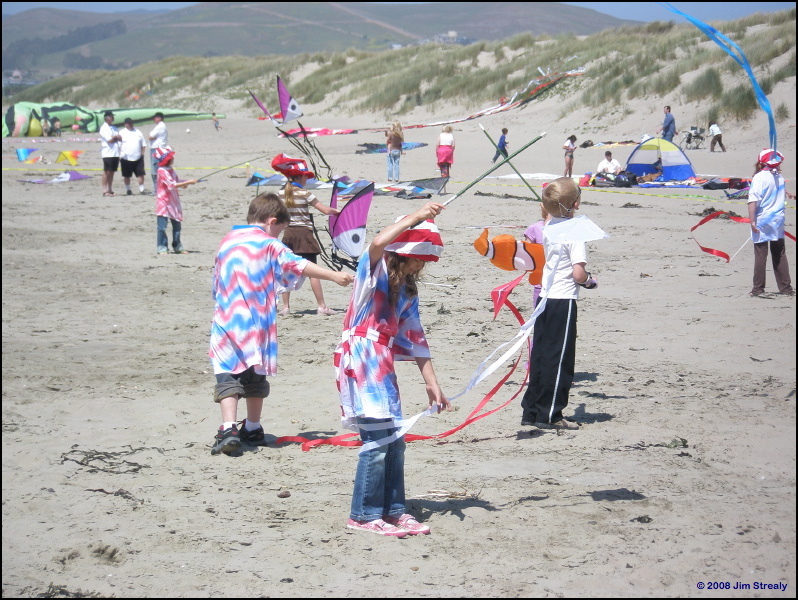 My kite demo of the day was “Have you ever seen a Kite fairy?” They called the assembly a success. My next school was Monarch Elementary. The speaker’s equipment did not arrive, so Jill Garcia and I winged it though the assembly. It wasn’t difficult to do. I pulled up a teacher and a student to fly the Indoor Rev. They both put some power into flying the Rev over their heads until they learned to bring it down and land it. Jill wowed me when she belted out “Let’s Go Fly a Kite” at the end of the assembly. It was so good I didn’t’ dare join in and ruin it. Come to find out she was a professional singer. 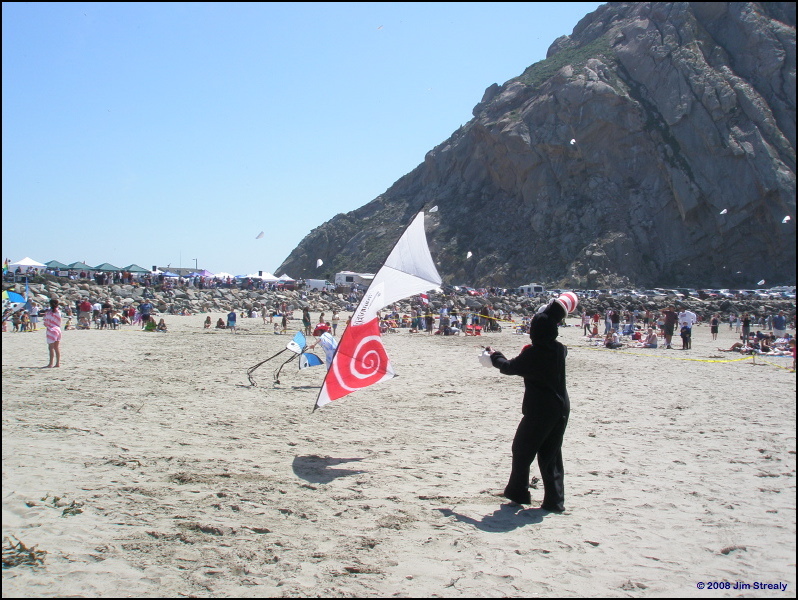 Saturday started with the annual Celebrate Morro Bay Parade. I love to fly in a parade. 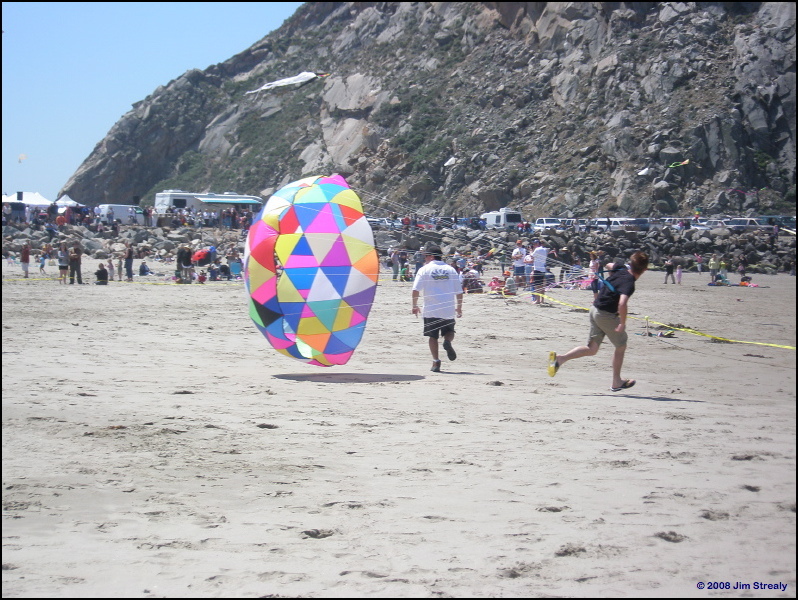 It wasn’t a kite parade, but still more then a few of the participants did carry kites. I wanted to fly my new red/white/blue Flag indoor Rev.- it’s so striking. The winds were light with just a few gusts, and switches. Danny Burnham spotted for me… (Thank you Dan.) You know, it’s important to avoid power lines speed bums and horse poo. The parade was twice as big as last year with dozens of gleaming Porsche’s that came into town to take part. A gentlemen drove me and my gear bag in his 1945 Ambulance with green fenders, woody back, doors, 6 coats of varnish.. The driver said at 45 mph it was an “E-ticket”. We never went that fast, but I enjoyed the ride as much as the lift back to the beginning of the parade. Now, when we drove to the beach Friday night to check out the festival location, we were skeptical. We saw nothing up and ready. Usually at Long Beach the outhouses are up, vendors are coming in. etc. Arriving from the parade Saturday morning, I was amazed to find rows and rows of vendors, sound system, restrooms and even Brian and company’s big kites coloring the sky. 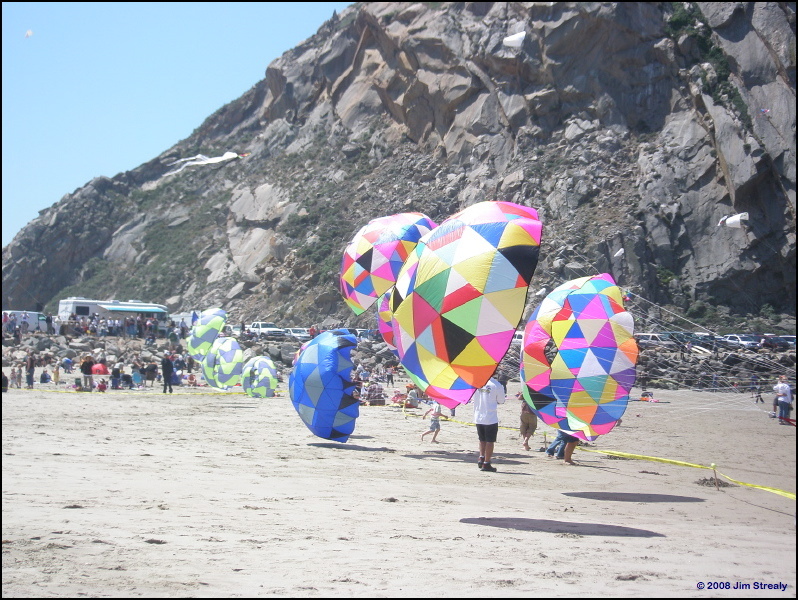 It was truly a kite festival. It sounds like a lot of work putting it together, but the girls from the Grizzly Academy had volunteered to help. Thank goodness, because I didn’t bring rebar, and the stakes that Brian let me borrow weighted 10 lbs each! Thank you Grizzly Academy! National Champion Quadzilla. I mean- Ron Despojado thrilled the crowd both on and off the beach. 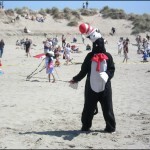 Announcing, dancing, kiteflying, living large! Go Ron! Mark, Jeannette and 7 yr. old Ben Lummas won the crowds heart with their fun routines. Alex Herzog wowed them, and the crowds can never get enough flying from Team Airzone. I missed new pairs fliers Dan Burnham and Mark Quirmbach fly and I was looking forward to it. Large kites were there too. Erick Fromeing brought his lobster and there were bears, gecko, bols and so many more. Wayne put up a little Peter Lynn Kitty on Sunday. I had to wonder if that kitty was Wayne’s or Mui Tings kite? 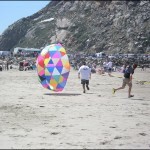 Claudia and Dave Sabalino were there to kite buggy and fly some pretty Revs on the side. 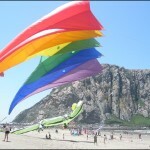 JJ Johnson and Brenda were there to fly all sorts of kites, take pictures and rest after their 8 hour drive. I always look forward to seeing them. 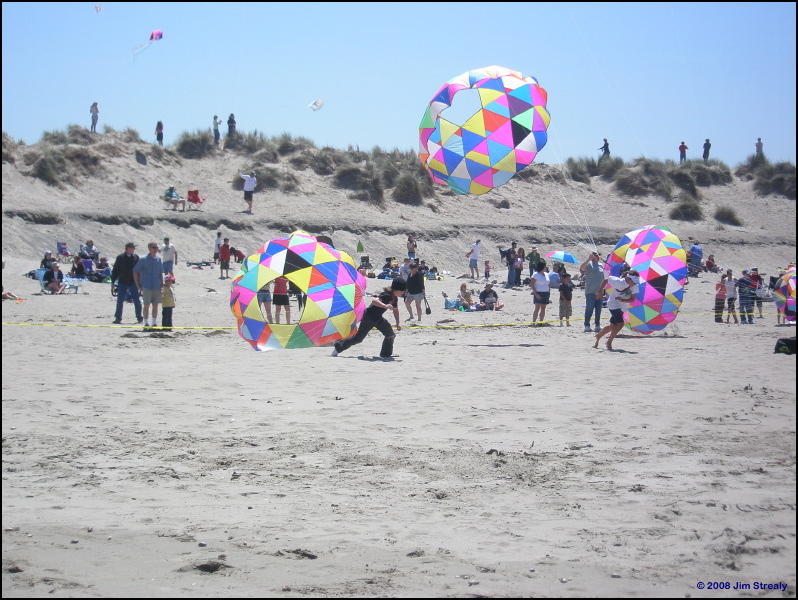 Two of the most popular kite events were the Running of the Bols and the candy drop. JJ and Francisco’s wife made the bols. They were the perfect size, wonderful multi colors and the kids and adults loved it. Jim Strealy’s candy drop was an easy success. 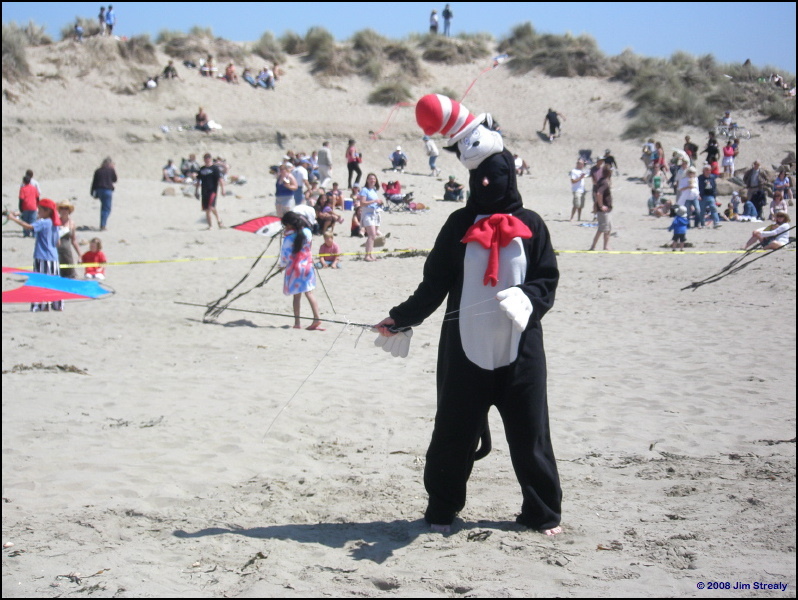 A Kite soaring up.. Candy falling down.. Children running on the beach…It was all good! It’s the perfect beach activity. 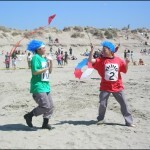 Down the beach, were the fighter kites. Seems like fighter fliers are always down the beach like little red headed stepchildren. 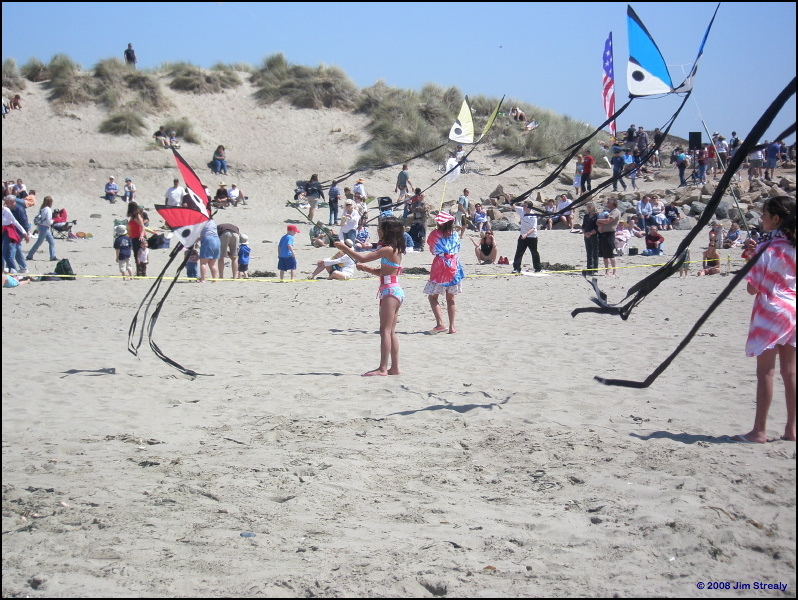 My mom’s first trip to Long Beach she saw two fighter kites playing or competing. 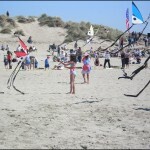 Someone was announcing, explaining what the kites were doing. 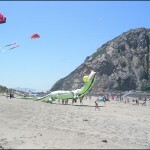 Of all the 3990 kites in the air at Long Beach, these were my mom’s favorite that week. I sat down in a chair and watched the fighter kites for a few minutes on Sunday. 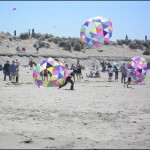 I saw 5 people with 5 little fighter kites darting and zipping everywhere. The pilots were laughing like crazy. I had no idea what game they were up to, but they made me want to play too! 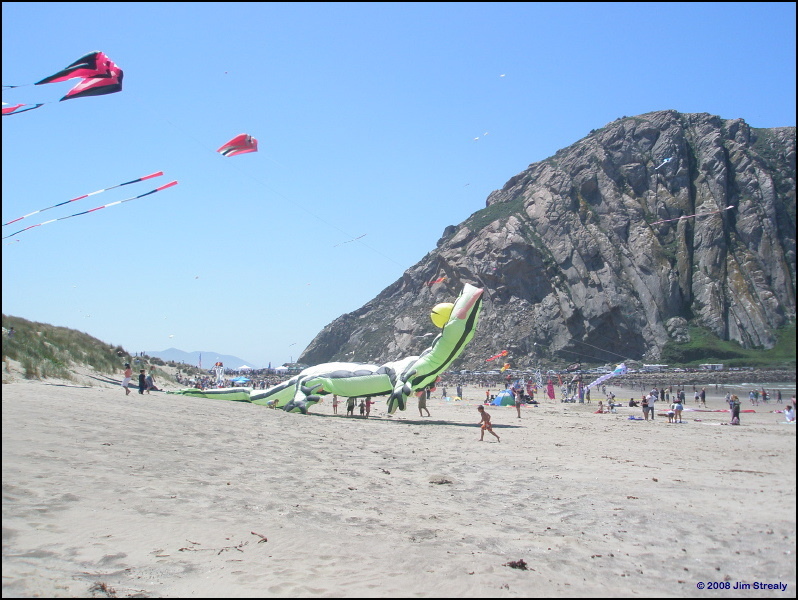 Darren Skinner, Gordy Anderson, Sharon Champie, Aaron Champie and Jay Bell were having the kind of fun that really pulls you into kites. All this and so much more I can’t even tell you for just a ONE DAY kite festival. The surroundings could not have been more picturesque, the beautiful weather surpassed by nada. Our sleeping berth over a kite store viewed the marina, Morro Rock and the Pacific Ocean right across the street and what’s got to be the best French Bakery in the U.S. two doors down. (Hey, this apartment rents for a great price!) Surely, it just cannot be beat. Nope… I don’t think so. The city estimates between 4,000 to 6,000 people attended. 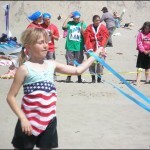 Not to bad for a 2nd Annual kite festival. It was wonderful seeing the kitefliers, learning new things, meeting Jack LaLanne, the exercise guru and resident of Morro Bay and his wife Elaine, and so much more. We all had our little adventures. This is just my side of the story. I like little adventures. I like California, and I’m glad they like me. 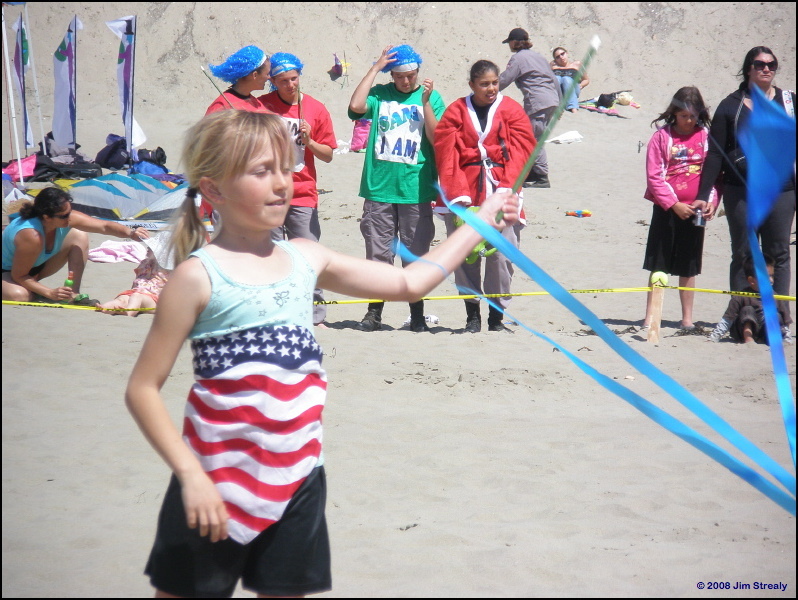 Thank you sponsors for the opportunity to share kiteflying in your town. Hopefully, we’ll do it again next year, only better. 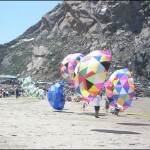 This entry was posted in 2008, Issue 60 (May/Jun), KL Archive and tagged festival, Morro Bay.